A U.K Web site has made the TomTom cradle and accompanying software available for pre-order at a cost of 99 pounds, or about $168.50 U.S., though a company spokesman would not confirm that price. The price on handtec.co.uk, discovered by Daniweb.com, is the first possible glimpse at the anticipated product's retail cost. 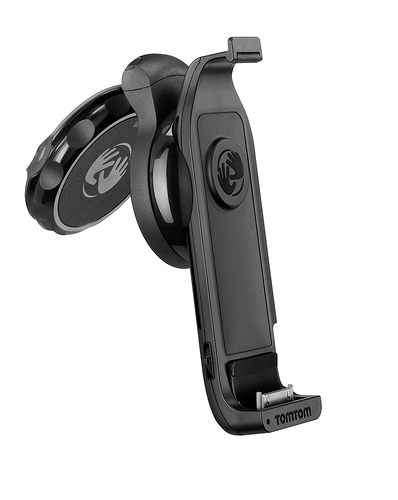 On Amazon.com, the least expensive new TomTom sells for $129.99, while most sell for more than $200, making the iPhone model competitively priced (excluding the cost of the handset). When reached by AppleInsider Wednesday morning, TomTom spokesman Kevin Carter said the company could not confirm the price. "At this point we haven't publicly announced pricing," Carter said, "either in the U.K. or the U.S."
First unveiled by Apple at the WWDC keynote in June, the accessory kit will act as a basic suction-cup mount for the dashboard or windshield. Additionally, it will amplify the GPS signal, support both hands-free calling and music through the stereo system, and charge the iPhone from the car's 12-volt port. A release date is not currently available. The application is said to take advantage of iPhone OS 3.0's support for true, turn-by-turn directions. The software will have both nation-specific and international maps from TomTom, will work in either landscape or portrait modes, and give voice directions. The software will reportedly be available for separate purchase from the App Store, and would rely on the iPhone's internal GPS receiver. The hardware kit, however, comes with its own, separate GPS. It will be one of the first external accessories to take advantage of iPhone 3.0's capabilities. The TomTom has already been beaten to market by a few competing options. The AT&T Navigator application hit the App Store in June. The software is free, but requires a $9.95 monthly service subscription, which the exclusive U.S. iPhone carrier plans to market alongside new iPhone sales at its retail and online stores as a bolt-on service. And the Navigon MobileNavigator application is priced at $99, but on sale for $69 through Aug. 15. It features NAVTEQ maps, lane assist, and day and night modes.